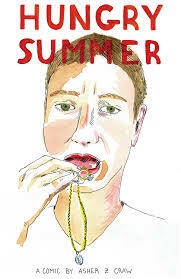 Hungry Summer, by Asher Z. Craw (Sparkplug Comic Books). Continuing my reviews of Sparkplug Minis, the mini this week is Asher Z. Craw's Hungry Summer. Craw's quasi-autobiographical comic Zebediah, was an unpredictable, absorbing and ultimately humane fantasy account of how he came to understand his nature as a trans person. Hungry Summer covers some of the same territory with regard to gender and identity through magical realism, but this time the focus is entirely different. 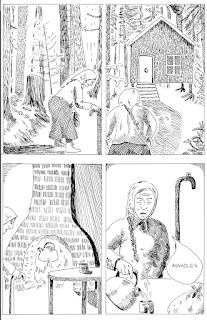 The main character of the comic is a bike-riding, shape-changing Baba Yaga, the Eastern European supernatural figure. Always an ambiguous figure, encounters with her would often result in both good and ill. At the start of this comic, a bunch of dudes heckle her as she rides her bike, which results in her spitting on the loudest and rudest detractor. That spit renders him entirely immaterial and forgotten, as a ghost who did not actually die. Ghosts are at least remembered, but in his case, it's as though he never existed. A woman named Yolanda who helps Baba Yaga is "gifted" with continuously coughing up expensive jewelry. When she later complains to Baba Yaga about this gift, she is gifted with coughing up extremely valuable and rare lizards instead.. The rude guy winds up in a boarding house for ghosts, led there by a man who turns into a woman when he walks into the house. Yolanda winds up back at Baba Yaga's house yet again, and this time the house (always on chicken legs) picks up and leaves with both of them in it. Meanwhile, the ghost, in search of Baba Yaga (ironically so that she could remove the very curse she laid on him, unbeknownst to him) is left behind. With a slightly ratty line that adds additional ambiguity to every panel, this is a story about visibility, agency and transformation. Here, the visibility and agency of the unnamed ghost are abruptly taken away from him after a lifetime of presumed privilege. Even as he's invited into a ghost house (in part to relieve him of his money), he is uninterested in actually reflecting on his own life or considering any kind of atonement; instead, he takes what he thinks is the easy way out at first opportunity. For Yolanda, her relationship with this trickster agent of change is far more complicated. 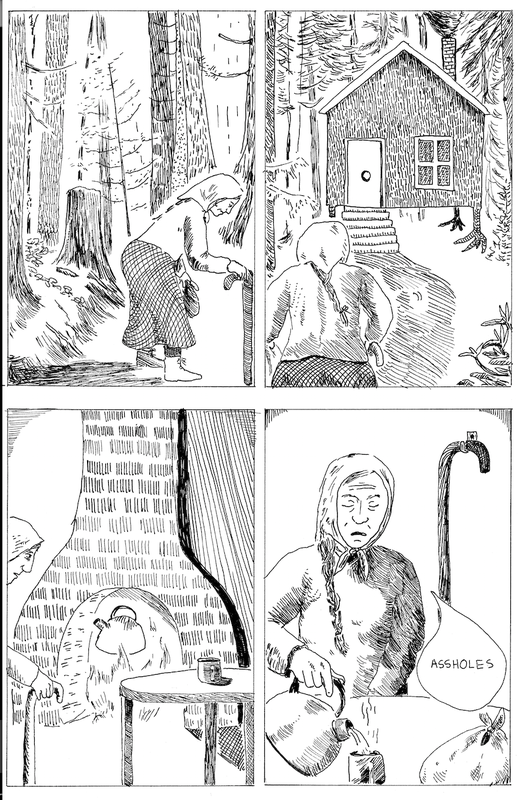 Drawn to Baba Yaga, she is told to carry her bag to her hut. Yolanda is portrayed as a seeker of something, but Craw makes exactly what ambiguous. Baba Yaga's transformative gifts all have a price, as the wealth Yolanda receives from the jewelry is obviously outweighed by the toll it takes on her life, and the same is true for the lizards. I found this an interesting commentary on material possessions and wealth, especially since Yolanda never actually asked for a reward or money. Instead, the gift she receives at the end, when she finds Baba Yaga yet again, is the chance to run off with her, to permanently leave her life behind and transform it through the act of giving of her presence rather than asking for something. It's the gift of establishing one's own identity and creating a space of self-integrity, even in the face of total societal abandonment. Craw challenges the reader to think about gender, privilege and identity without making the importance of these ideas explicit. Indeed, the fabulist nature of Craw's storytelling actively deflects any sort of polemical quality his comics have without losing any of their thematic bite.